The Spaceship Earth time machine blasts ahead 15,000 years to an era of cave-dwelling people. We enter a dimly lit cavern with men, women, and children in the flickering light of the fire. Here is where we first see the immense details that went into this attraction. The original script indicates that a “prehistoric shaman” is speaking (storytelling) to the people about a hunt (from the previous scene) and that the wall paintings (recordings) help record his tale for future generations. During this time of the Upper Palaeolithic (Late Stone Age) there were deteriorating climatic conditions and herds of reindeer, bison, horse, mammoth, woolly rhinoceros, and red deer (1) were hunted by these humans for survival. You can see various animal skulls (such as dire wolves, a sabertooth tiger, a bear and a lion) in this scene of Spaceship Earth and they were cast from molds of actual animals in the Paleolithic collection of the Page Museum in Los Angeles (2). 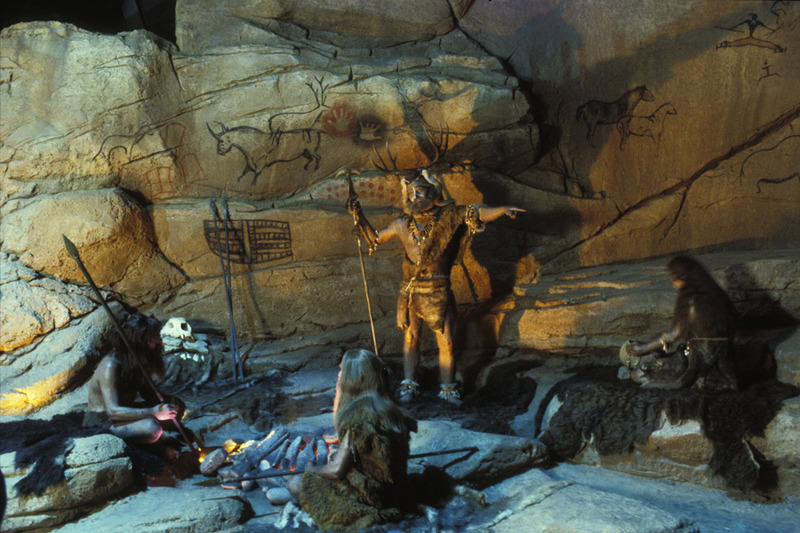 Aspects of how the animals were used is seen in this cave scene from how they wear them, eating around the fire, preparing hides and fur, and the shaman headdress. Living as hunter-gatherers, these species of human were always on the go – the cave was not a permanent home. The wall paintings weren’t just to help future generations but would also benefit the next inhabitants who came along needing shelter. The observation of animals was not merely a pastime, but a matter of survival (3). 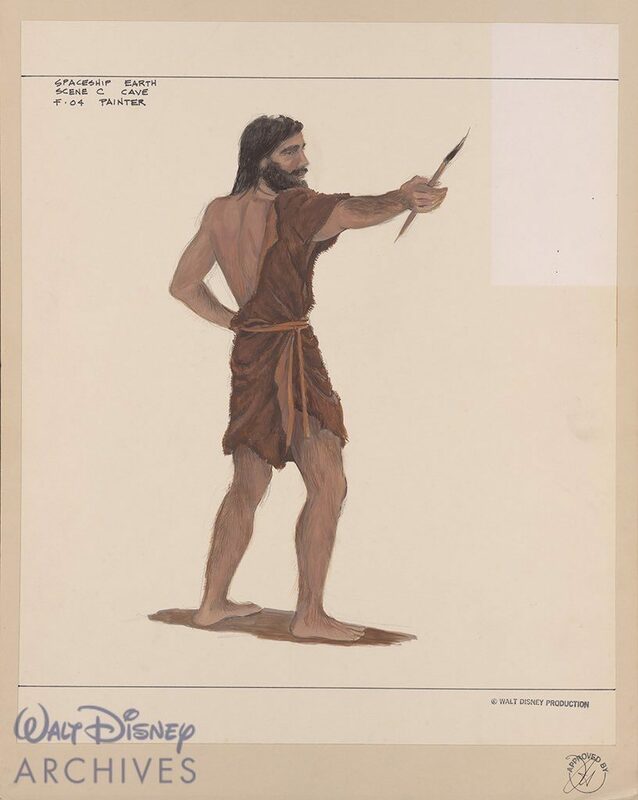 Because of this intense connection with nature – the caveman art was remarkably better at illustrating animals than artists today. In today’s version of the attraction – the art comes to life via video projection and along with the art on the walls of the cave are detailed recreations of what was found in the Lascaux Cave in Southwestern France, the Caves of Altamira in Northern Spain, and others. They were the earliest professionals. They mediated between the inner life of the tribe and its external affairs. They presided at all “rites of passage” such as births, puberty initiations, marriages, and deaths as well as all “rites of intensification” which attempt to strengthen the tribe’s relation with powerful natural forces in times of crisis such as famine, storm, and epidemic (4). 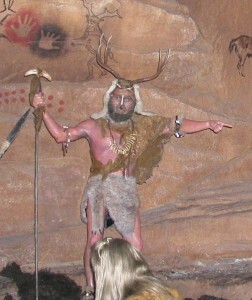 The shaman outfit includes a headress and a deer bone necklace (5) as depicted in the scene. 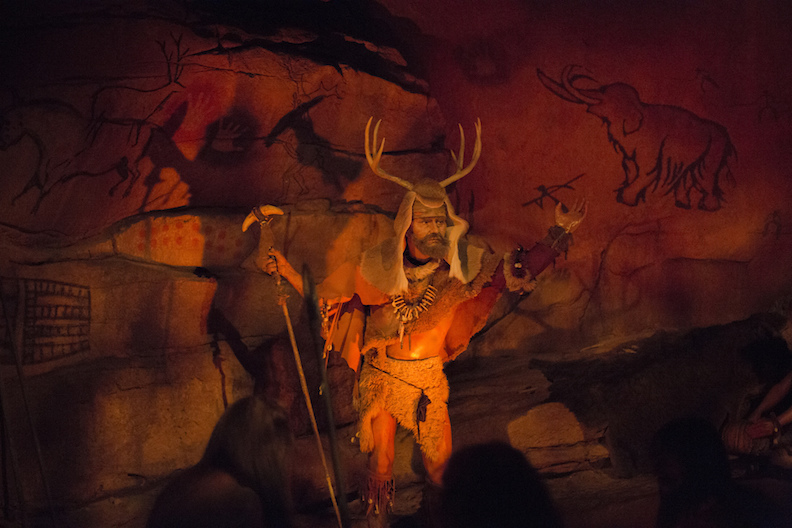 In the latest version of the attraction the Shaman’s voice is quieter and he’s had a few standard animatronic updates. 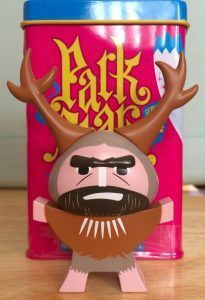 As a tribute to his popularity – Disney launched a “Caveman Vinylmation” character. Because animatronics are complex, time intensive to create, and expensive – its common to duplicate the models that are made and dress them differently. 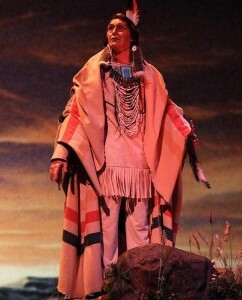 In this scene – the Shaman is said to also be Chief Joe from the American Adventure (2). It takes 15,000 years to come up with the next bright idea: recording our knowledge on cave walls. There is only one small problem, when we move, the recorded knowledge stayed behind. With the development of language came a vital key to our survival. For the first time, we could share and learn from one another. We bonded together in small tribes and prospered. No longer isolated, no longer alone. In primal tribes, the skills of survival are passed on to new generations through the art of storytelling. 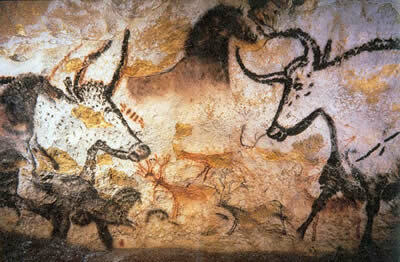 Not trusting this knowledge to memory alone, our ancestors create a lasting reminder with cave paintings. On cave walls we inscribe our greatest triumphs. A growing record of our deeds, to share with others so they too may greet tomorrow’s sun. With soot on stone we left the blueprint of how we killed the Dragon Beast. From all the caves our brothers came and gathered round a single campfire blaze and learned – learned well from what had been recorded there: a plan to face tomorrow’s noon.